A smaller sized map I've made based on Imperium Romanum's size. Based around a bunch of lakes, I figured the name fit. The names for bonuses are random war-related words I thought up. The names for territories are just completely random words, although there might be a couple easter eggs thrown in. This is my first map, so please feel free to criticize it in any way shape or form, it'll help me improve if I make another one in the future. The scenario of Large vs Small bonuses wasn't really intended to be balanced, I just threw it in there for fun, depending on the number of picks each team gets though it could be fairly competitive. Entertaining. Lots of choke points and easily defensible bonuses. 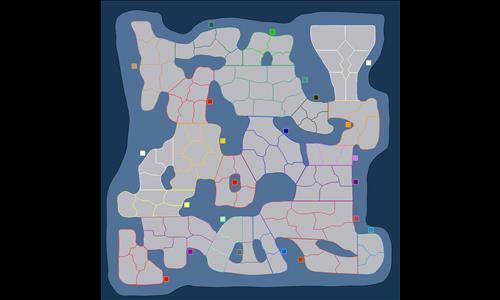 This should be an excellent map for PvP FFA. Review by NinjaNic on 2/6/2014. I like how you made the ones in the "A" bonus all start with A, and the "B" bonus all start with B, and so on. It's also a clever and really nice looking map. Great for teams and free for all! Review by bahurma on 2/10/2014. Review by Captain Ercoupe on 1/16/2017. Great small map. So much fun...thanks! Review by MoOoOoOoO on 4/6/2014. Review by King Sublime on 2/25/2014. Good map, I'd play again. Review by Backstabbery on 11/2/2014. Can be very challenging or very easy, spawns seem to be very unfair a lot of the time. But its still a great map. Review by Davout on 5/12/2015. Review by MoneyMakingMitch on 2/13/2017. Review by Kezzo on 7/26/2017. Review by INSIDE on 1/16/2016.